A boxing promoter asks a sportswriter Eddie Willis to talk up a fresh-faced Argentinian import, Toro Moreno. But he quickly sees that Toro isn't up to a heavyweight championship fight, and Willis must battle with his conscience. Bogart's final film, and while he shows some signs of his illness in the film it is one of his finest. This film is a fitting tribute to a great American film icon. In his previous film, the minor classic "The Desperate Hours", Bogart was clearly ill. 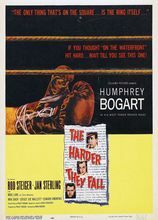 In "The Harder They Fall", Bogie is in even worse shape, pale, shaky, pasty and puffy. He was dying of throat cancer and the insidious disease would claim his life nine months after the film was released. In the movie, Bogart plays a down on-his-luck sports writer who, due to unemployment, takes on a job as a publicity man for a Panamanian boxer named Toro Moreno. Moreno's management is cheating the poor slob by setting up one patsy after another who takes dive after dive on a whirlwind cross-country boxing tour. Thanks to Bogie's contacts in the media and his writing skill, the nation falls for the tale of the "giant from the Andes". Toro himself believes his own press until, in a championship fight, he gets beaten to a grotesque pulp. Pangs of conscience finally hit Bogie and he helps the fighter escape back to his home in South America and begins writing a tell-all expose on the dirty business of pro boxing. It is a wonderful, soul-searching performance by Bogie with Rod Steiger perfectly villanous as a crooked manager. As stated above, Bogart was dying and he was aware of it. This adds an additional level of pathos to the film as we see a clearly in-pain Bogie doing his best to right the wrongs that he has wrought. We know he'll take a turn for the better, but in the classic Bogart tradition, we also know he'll do it slowly and with a certain bewilderment. The pain in his eyes is as much from the cancer eating away at him as it is from the character's reluctant involvement in what he clearly knows is wrong. Mark Robson's direction is spare, but that's fitting. This film noir doesn't require anything fancy. The boxing sequences are adequate although former champion Max Baer is far too old to be actively fighting in the championship fight scene. The additon of Baer (who in real life was one of the great gentleman of his or any other era) and Jersey Joe Walcott in the movie lends an air of authenticity to the proceedings, not because they can be taken seriously as active fighters, but because, by their presence, they are acknowledging the basic premise of the film: the fight game is a dirty business. Walcott, as an actor, could have had an interesting career, but he is under utilized here in a valet role. Cinematographer Burnett Guffey does a credible job in lighting the film, giving us glipses into the nighttime world of work-a-day boxing. His lighting is so skillful that, even in the day scenes, we somehow feel the ominous hues of night always approaching. The supporting cast is nothing short of excellent across the board. Steiger, the under rated Neihmah Persoff, Jan Sterling... need we say more? This is a fitting farewell to an actor who turned film noir into movie magic. See this film and watch a pro bucking it up against all personal odds to get the story done, get the film in the can and get on with a life that was quickly running out of time.